Sometimes life can be overwhelming. I have many lovely experiences to recount from the last few weeks, but putting finger to keyboard has not come very easily to me lately. So apologies for the lateness of this post. 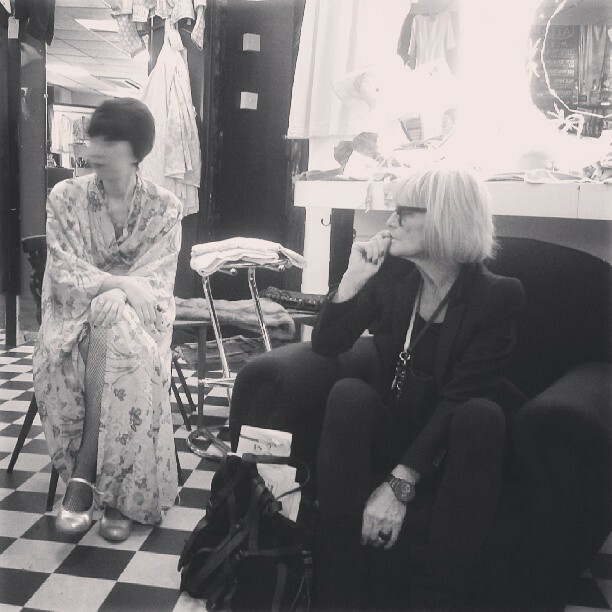 Three weeks ago, I was very kindly invited to meet Barbara Hulanicki (designer, illustrator and general legendary goddess…) at Paper Dress Vintage in East London by the gorgeous Sophia of Black Spring Press who have just published Seamless From Biba. Shoreditch is not a natural habitat for Miss Peelpants, and I knew I was limited on time due to working that evening, but it was Barbara Hulanicki… how could I not? As a ‘blogger’ event, I had assumed that there would be a veritable vintage scrum and scramble. I was pleasantly surprised to walk into a peaceful and beautifully appointed vintage shop, and see Margaret of Penny Dreadful Vintage, Liz of Advantage in Vintage and Lisa of Snoodlebug. Later I realised that Ana of Where The Roses Go was also in attendance, but sadly didn’t get a chance to talk to her (though I did admire her amazing hair from afar…). And that, was pretty much that. It was intimate, casual and so, SO much fun. Sadly I didn’t have any of my more – ahem – flamboyant Biba pieces to hand, as I was staying with my mum in London, but I was able to wear my most favourite and wearable piece of Biba. 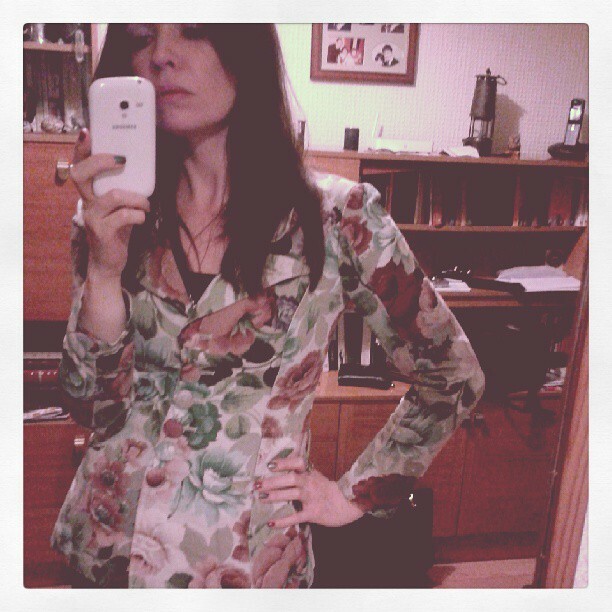 A thick cotton fitted jacket with the most extraordinary floral print, which I knew I had to possess the moment I first saw it in the V&A Cutting Edge book. Possibly the second most exciting moment of the evening was when we were introduced to Barbara and she spotted my jacket, did a double take and pointed at me with an exclamation of ‘I recognise that!!’. She was able to confirm that it was indeed, as I had heard rumoured, a Sanderson upholstery fabric. 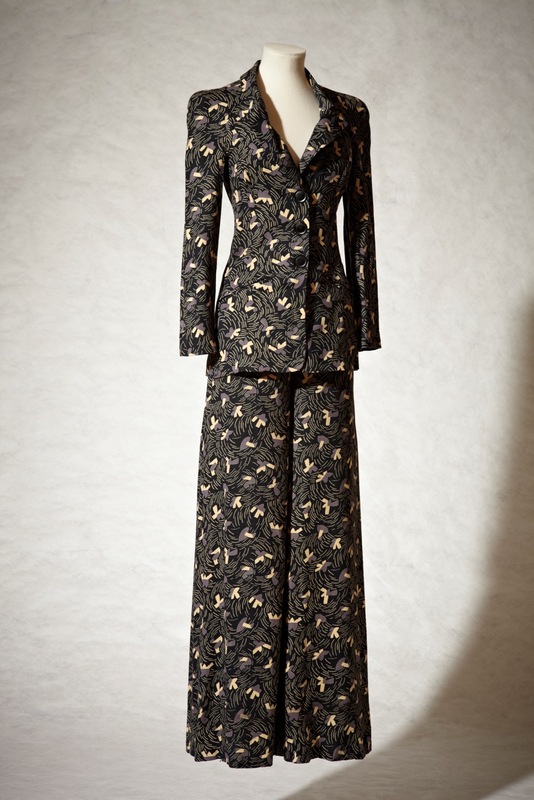 She went on to say that they produced it in four colourways, and reminisced about taking four models to Italy – all wearing the same suit in a different colourway. ‘The Italians thought we were mad!‘. What followed was more like, as Barbara said, a tea party. We all sat in a small circle, on squishy sofas and this all rendered it rather hard for me to take many photos or make many notes. It really felt like she was in conversation with all of us, and as I was directly opposite I just wanted to enjoy having a natter with one of my all-time inspirational people. So I made some sketchy notes afterwards and make no claims to precise quotations, just details. I took the chance to ask if it was true that she used ‘vintage’ fabrics from the Thirties and Forties, and she confirmed that they did indeed. Kensington High Street was home to three department stores, Barkers and Derry & Toms being the most well-known but Pontings (further down from Derry & Toms, to the left as you emerge from High Street Kensington station) was famous for its haberdashery department. So in the early Seventies, when Pontings was on its uppers, Barbara was able to purchase rolls of unused fabric from thirty/forty years earlier. She admitted that they often had to cut around faded panels and other flaws from storage and age. During a discussion about how films had inspired her designs from a very young age, and then the fact that Biba clothes were often used in films of the time (I’ll Never Forget What’s’isname was cited as an example, and roundly dismissed as being terrible. Something with which I greatly disagree but wasn’t about to get started on…), Barbara admitted that many things were filmed in Big Biba (including the Suzi Quatro video for Devil Gate Drive) without her knowledge. She laughed as she remembered driving past the building late one night and seeing lights on; something was being filmed and she had no idea! I was keen to ask her about whether or not she had experienced much sexism, or whether Fitz had largely protected her from the worst of it. 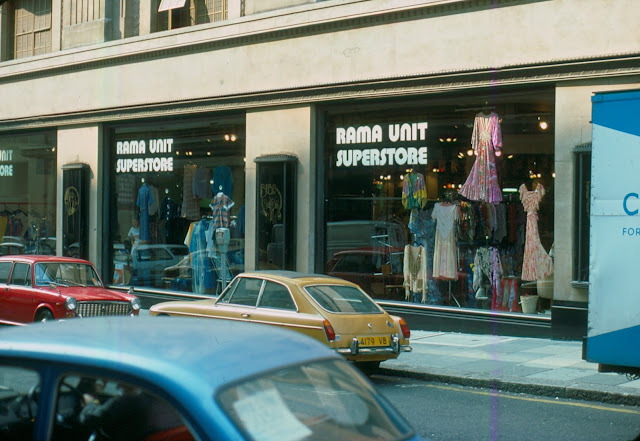 ‘Ohhh yes‘, she exclaimed, and said that, in the early days of Biba, nobody had taken her seriously and the suppliers she was dealing with would often leer at her ‘girls’ in their mini skirts and were dubious as to whether they should even be dealing with her. Of course, later on, when they saw how successful Biba was and were trying desperately to sell her things, she took her revenge. Explaining that they had a meeting room with a very, very low and large table, she laughed as she remembered that they were expected to sit on cushions on the floor. ‘And of course they’d all come straight from boozy lunches and when they sat down, their stomachs were hanging out over their trousers. And then we’d send the girls in, and they didn’t know what to do‘. Psychological warfare on lecherous pigs? Barbara is definitely my kind of lady! When asked about the make-up colours, including green and blue lipsticks and blushers, Barbara confirmed that they all sold well and that there was always a veritable scrum surrounding new colours appearing in store. She remembered another occasion in Italy, as their make-up was being sold through Fiorucci there, where they had models each made-up with a single colour scheme. So one had blue eyeshadow, mascara, cheeks and lips, another green, and so on, and they all piled into the back of a taxi afterwards. Of course the taxi driver was too stunned at what he saw in his mirror to drive off, those mad English! 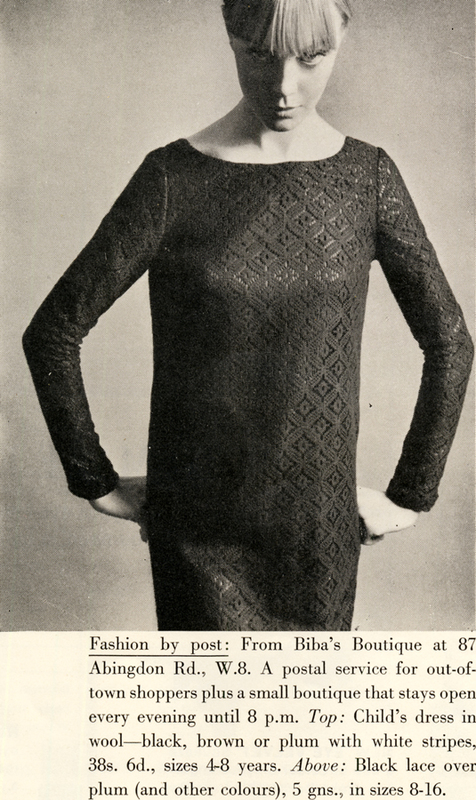 The majority of Biba models were taken from the shop floor, including Madeline Smith, except for a few notable exceptions such as Stephanie Farrow and Ingrid Boulting. 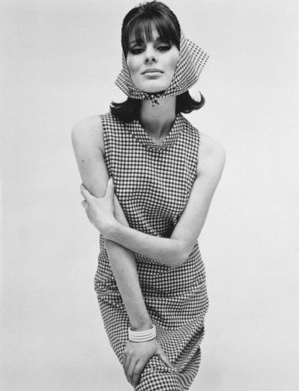 The latter of whom Barbara admitted was her favourite model. She remembered an occasion where Boulting had been hired for a make-up shoot, and then said – on the day – that she couldn’t wear mascara. ‘But we’re paying you to wear the mascara‘ – she exclaimed in mock frustration at the memory. She also remembered a photoshoot where Sarah Moon had burned every single negative except for one. ‘This is the only one which came out’ claimed Moon, Barbara laughed as she said ‘She meant that was the only one she was happy with and had burnt the rest!‘. Fitz refused to let her use the solitary negative, ‘as it had cost us £1000!‘ and put it in the safe. (It was, apparently, used at a later date when the shock had worn off…). She also said, with great sadness, that Helmut Newton was one of her favourite photographers to have worked with, but that she was too nervous to ask him again. 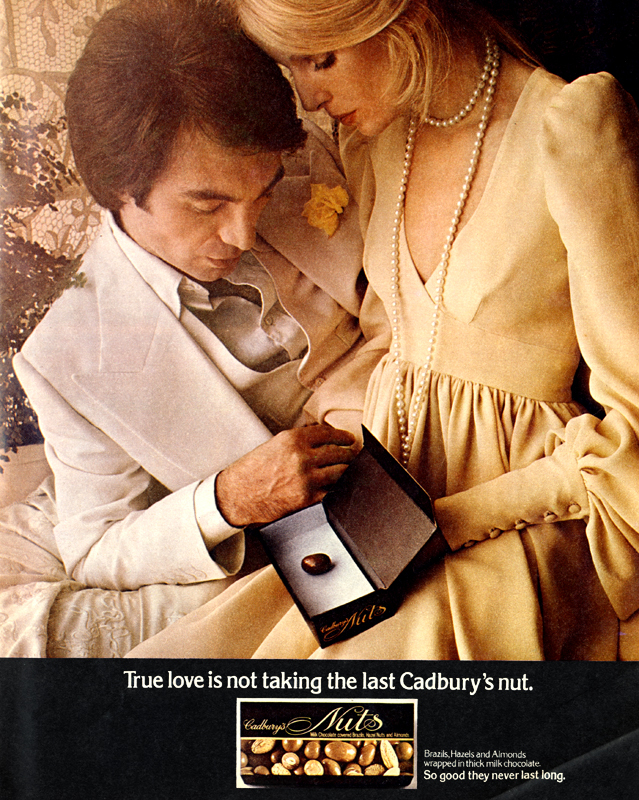 Then, years later, his widow told her that he had loved doing the Biba catalogue and was hoping to be asked again. Which I’m pretty sure is an important lesson in ‘it never hurts to ask’ that we could all do with heeding. One of the first questions I asked, but which feels more appropriate to mention here last, was for her opinion on having been so widely criticized at the time, in quality terms, and yet now so widely collected and sought after by serious collectors and museums. She smiled and said ‘Oh it’s wonderful. I only wish that Fitz had been alive to see it!‘. I get the feeling that he always knew, because he always had faith in her and in Biba. It’s a testament to the both of them that it is still so coveted to this day, and retains a mystique despite all the copies and relaunches. She recalled how the attempt to sell Biba in American stores was a bit of a disaster because they were a completely different shape to the British girls. Too muscular in the arms and legs for tiny Biba sleeves and skinny suede boots. 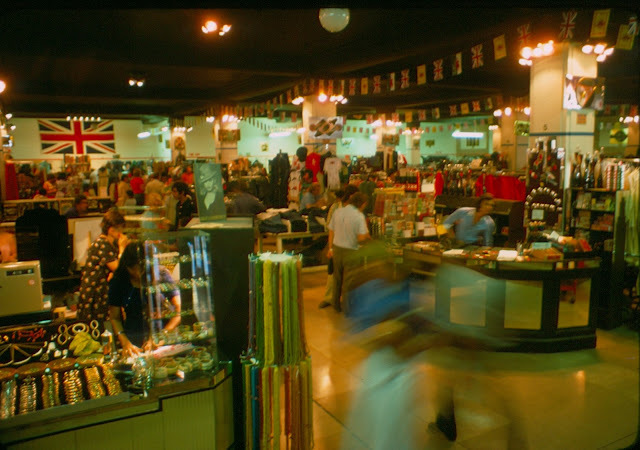 I also asked her if she thought that the Biba concept (i.e the complete lifestyle from one shop, with one strong identity) could ever work again. ‘Oh yes, definitely, but the price points would have to be much higher‘. They did use all the products themselves, including the baked beans and dog food. 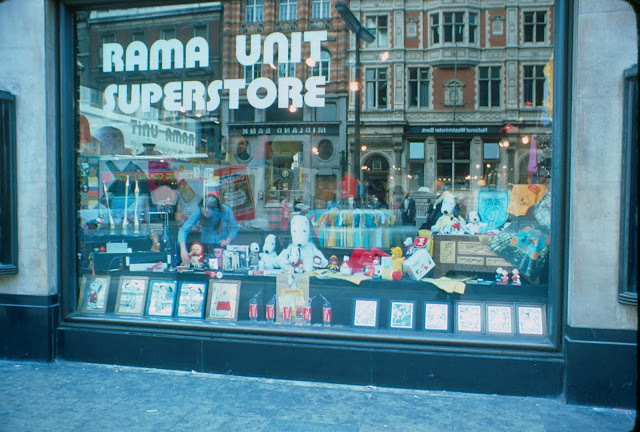 ‘The baked beans were actually Heinz beans but in Biba packaging… We used to get people complaining about the fact they were 3p more expensive than Heinz!‘. We moved to pick up our books and have them signed, and she very kindly took our business cards. As I handed mine over, I had a momentary panic – my logo girl illustration is the image on the front of my business card! I’m basically handing over my puny illustration to Barbara Hulanicki, a woman whose illustration-style I worship (while trying desperately hard NOT to copy…). The panic dissipated as she asked if the illustration was mine, and then said something very complimentary. I’m not going to try and quote her, as I wouldn’t want to put the wrong words in her mouth, but needless to say – if Barbara Hulanicki compliments you on your illustration, your life is pretty bloody amazing at that precise moment. As we talked about living in Brighton, and the recent exhibition, I remembered how upset I was to miss the opening event there due to a pesky toe-breakage. I think it’s safe to say that the karmic universe delivered me a more than sufficient replacement. It was an hour of pure joy, which I will always treasure. Thank you to everyone who made it possible, and mainly to Barbara herself for being so engaging and friendly. Seamless from BIBA is currently available for £17.50 on Amazon. 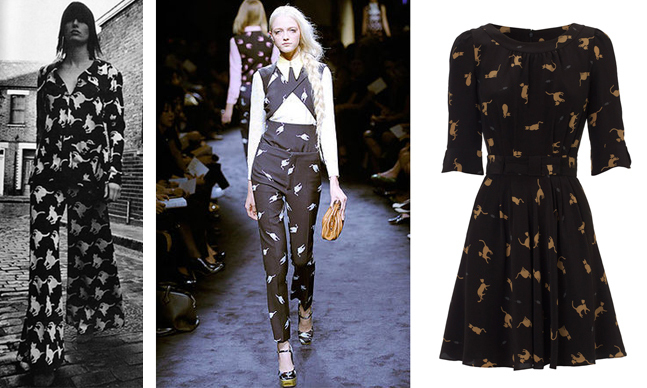 Fashion by post: From Biba’s Boutique at 87 Abingdon Rd., W.8. A postal service for out-of-town shoppers plus a small boutique that stays open every evening until 8 p.m. Above: Black lace over plum (and other colours), 5 gns., in sizes 8-16. Photographed by Michael Cooper. 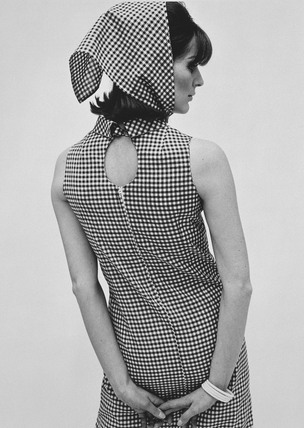 Scanned by Miss Peelpants from Vogue, January 1965. 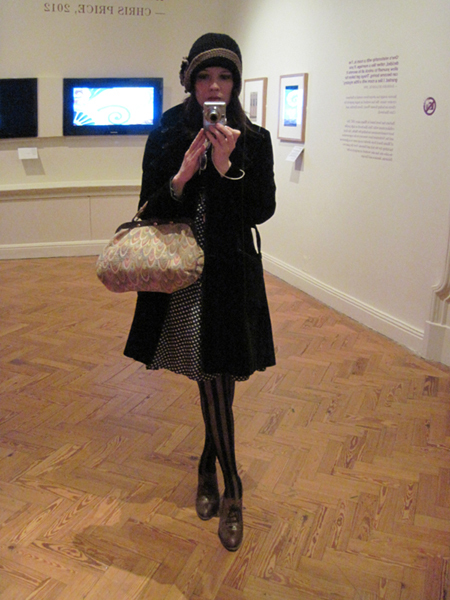 My sadness in missing the opening of the Biba exhibition at Brighton Museum back in September was slightly assuaged by an email from the lovely Jo Ann Fortune of Visit Brighton, informing me that I had won two tickets to go and see it. I never win anything, so naturally I was shocked and delighted. I was determined I would not go until I was walking properly, so Mr Brownwindsor and I finally made it there a couple of weeks ago, on a frosty Sunday afternoon. Needless to say, it was a delight. 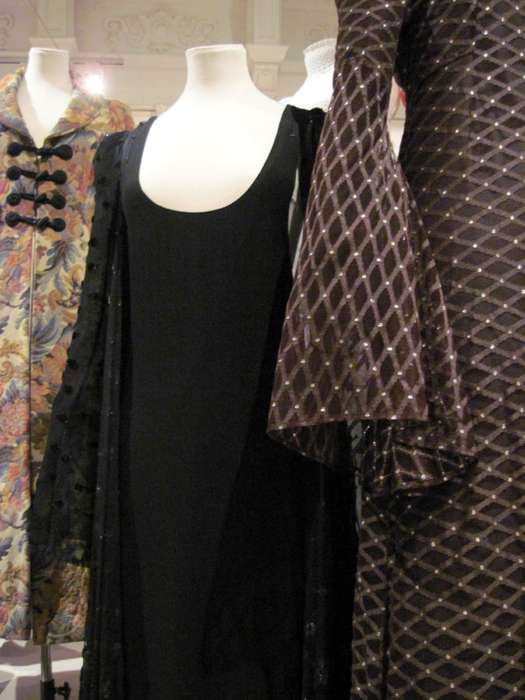 I had thought, as someone who owns and sells a lot of Biba, that I would be confronted with a whole host of pieces I have already had the pleasure of handling or wearing. It was a pleasant surprise to see that the vast majority were either entirely new to me, or pieces I have lusted over from afar for years. 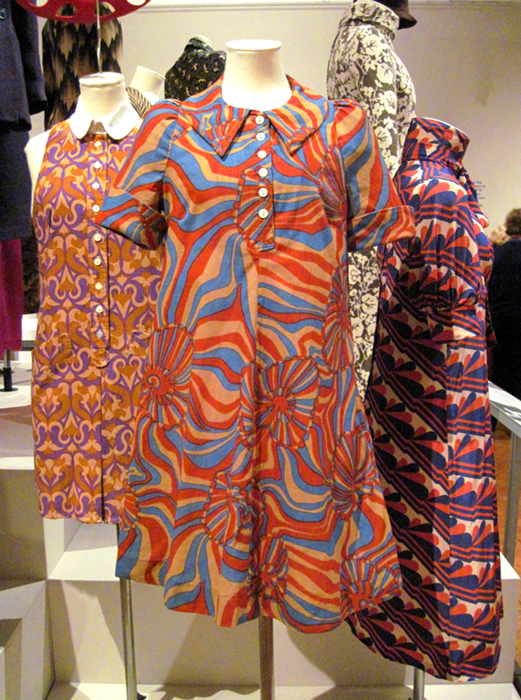 That is a credit to the design prolificacy of Barbara Hulanicki, and to Angie Smith and Murray Blewett, whose impressive Biba collections form the bulk of the exhibition. Further to my blog on the subject a while ago, there is also a rare surviving piece from that first foray into mail order – the outfit which launched the entire label. 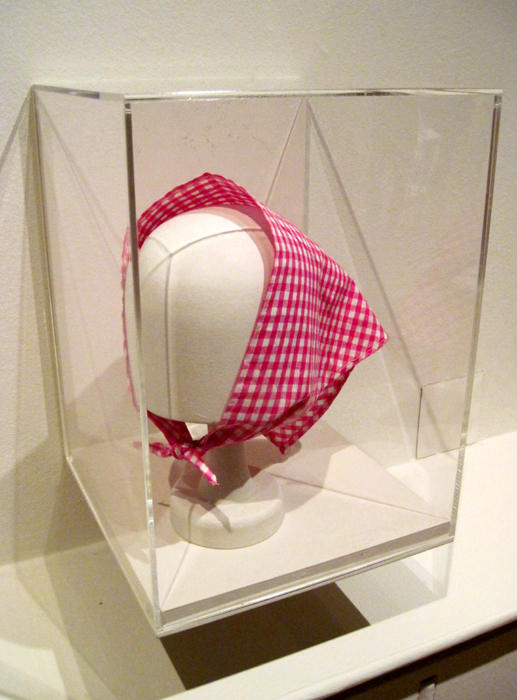 Sadly it is only the headscarf, but incredibly tantalising to see up close. 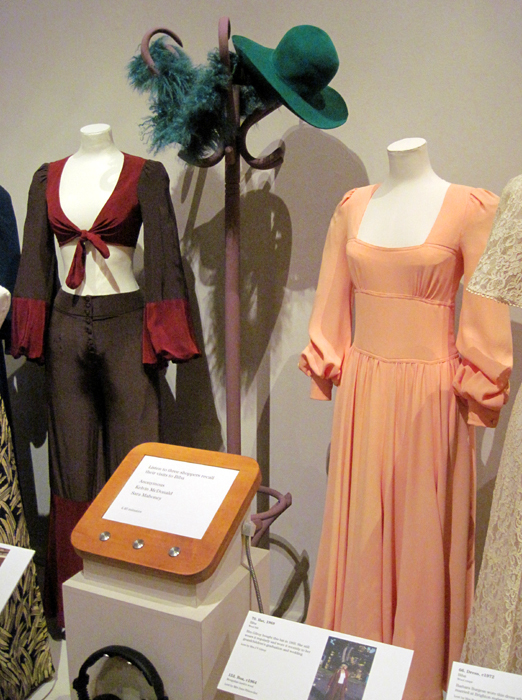 There were plenty of pieces loaned by members of the public as well, with fascinating stories of wages being splurged in the name of Biba, descriptions of the interiors, and of the most outrageously wonderful wedding outfits. Seriously, how have we moved so far back away from the modernity of wearing a cropped satin top and flares ensemble for a civil ceremony? These women were fighting against the roles their mothers had felt obliged to assume; fighting against convention, against sexism and the virginal white wedding which has inexplicably dominated since the 19th century. I loved that these women simply picked a phenomenal Biba outfit and couldn’t give two hoots about whether anyone thought they were ‘one of them’. Further cabinets and displays covered Barbara’s early life, her time in Brighton (of course, and we slightly geekily went to find her former residence in Grand Avenue after seeing the address printed in a newspaper clipping! ), the genesis of Biba and the various aspects of the Big Biba lifestyle which were catered to by the time they moved into the Derry and Toms building in 1973. Yes, there are soapflakes. 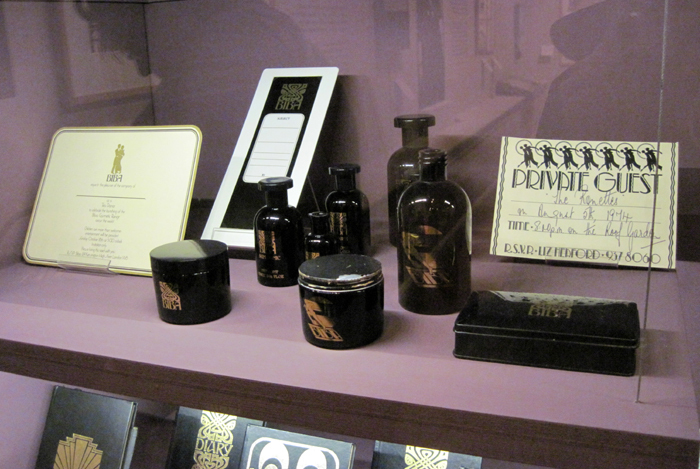 I feel more could have been done to evoke the Big Biba spirit, particularly in the main display room. Certain nods were made, such as the hatstands, but it was minimal and far too tasteful. Although credit where credit is due: whoever chose the playlist should be greatly congratulated, hugged and applauded for their taste and understanding of the Biba vibe. The final room, which touched – a little too lightly – on Barbara’s other talents for illustration and interior design, also featured a row of pieces from her (and I may make myself unpopular here…) half-hearted George at Asda and Topshop ranges, with another piece from the hateful Kate Moss for Topshop collection (inspired by a wrecked Biba jumper which looks suspiciously Eighties to me). I felt that this final display was a poor finale to what was otherwise a lovely, small-but-perfectly-formed, exhibition. Why would you want to leave with such a bad taste in your mouth? On the other hand, they make the longing for clothes of the quality of Biba even greater and show up the endless re-hashing of Seventies design for what it really is. 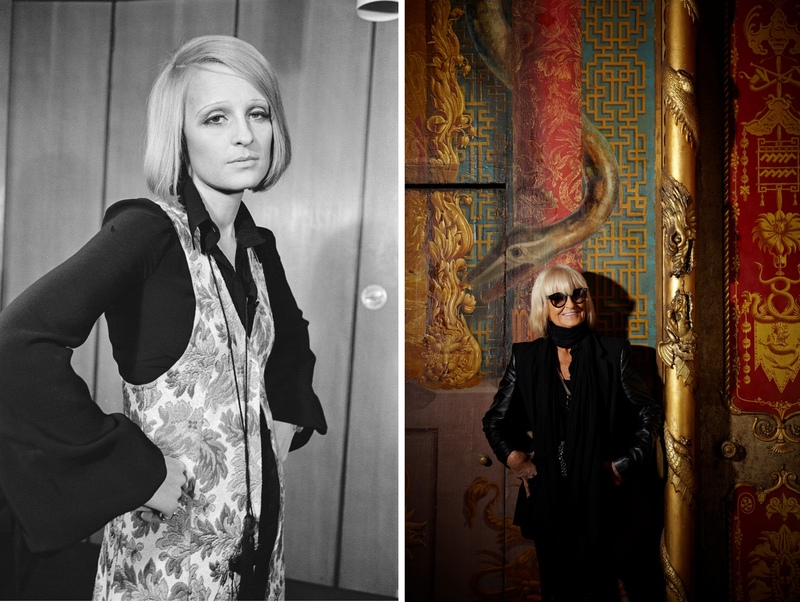 Biba and beyond is a wonderful celebration of one of the most creative periods in British fashion design we have ever known. It should also be a wake-up call for people to become more discerning in their sartorial choices. 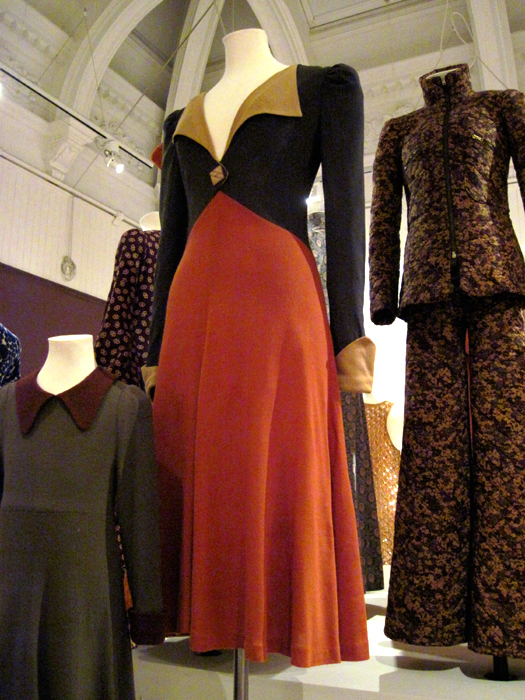 People compare Biba to Primark, but the levels of manufacture are not even remotely comparable. Who is designing these days? Who is actually taking inspirations and not just duplicating them wholesale, but in fact creating something entirely new and fresh? Barbara did, so can someone else. 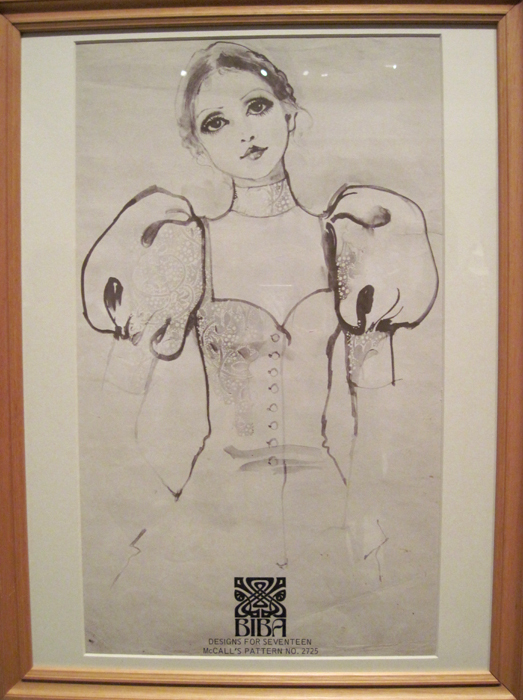 Biba and Beyond is on until 14th April 2013, and is a wonderful feast for the eyes. It may also be bad for your bank balance, since you will want to own more and more Biba. Trust me, it’s addictive. 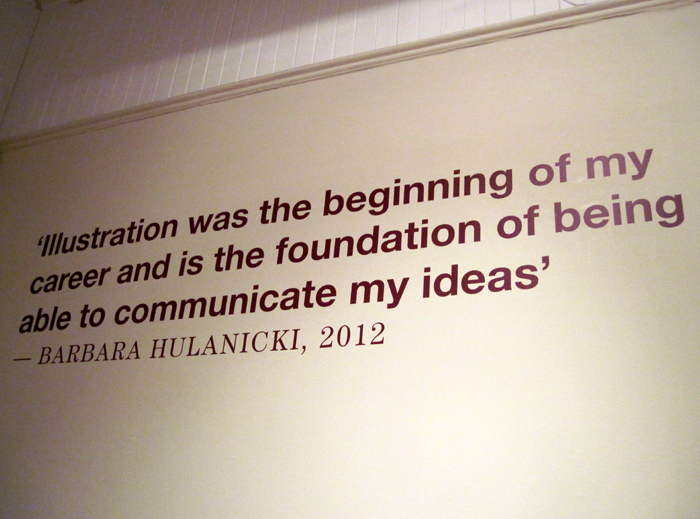 I was delighted to be asked to submit a question for Barbara Hulanicki, as part of Visit Brighton‘s series of promotional videos for the upcoming Biba exhibition at Brighton Museum in September. 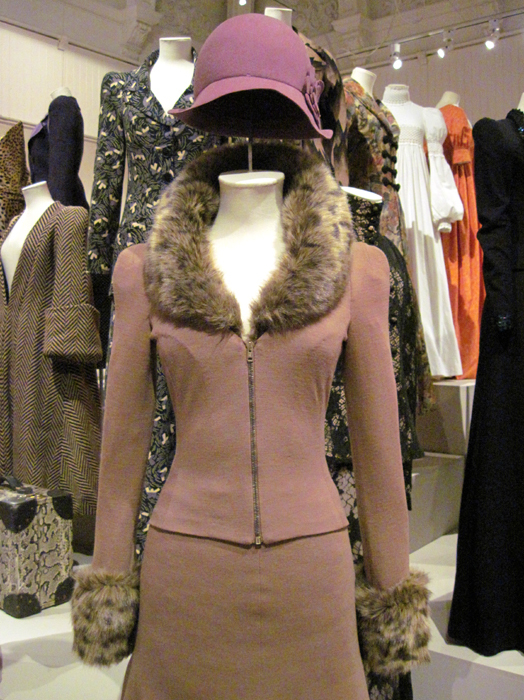 I decided to go out on a geeky limb and ask about the Biba ‘couture’ range which I blogged about in February of last year. Thanks to Jo-ann Fortune at Visit Brighton and to Barbara herself. The exhibition opens on the 22nd of September and I am very much looking forward to seeing it, no doubt decked out in my Biba finery. I will, of course, be blogging about it once it has opened, so stay tuned! 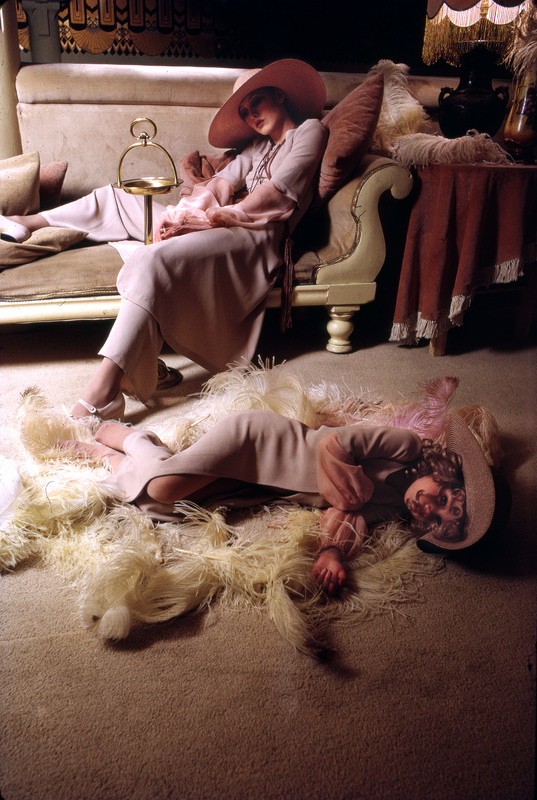 If this dress was so damn popular, and sold in such vast numbers that Barbara and Fitz struggled to keep up with orders, then why on earth have I never seen it outside of these photos by John French? Does anyone own it? Do any museums possess it? Does anyone remember owning it? Anybody? ?